Espace Dalì, the Salvador Dalì museum in Montmarte, is a weird and wonderful place. It’s full of sculptures of his famous melting clocks, creatures with the bodies of elephants and the legs of giraffes, lots of unusual religious imagery and the famous Lobster Telephone. In a word, it’s surreal! The sculpture that struck me the most was Homage à Terpischore. It’s a bronze sculpture of two female figures, each facing the other, reaching out with an arm in a ‘mirrored’ high-five gesture. One of the figures is smooth and polished. All her lines are curved and she looks like a representation of a woman from classical mythology. Her counterpart is a cubist sculpture, all sharp edges and angles. 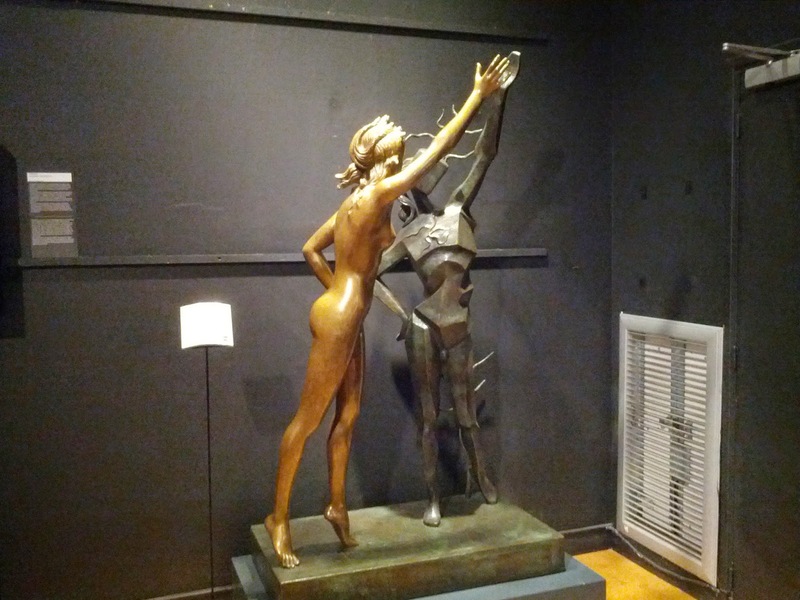 The two figures together, according to the sculpture’s description, “represent the real and surreal aspects of the Dance”. Salvador Dali's Hommage a Terpsichore. 1977-1984 Bronze. Terpischore, as it turns out, is one of the nine Muses and the goddess of dance and the chorus. Upon reading this, I had an instant “I knew it!” moment. I just had a feeling it had something to do with dance. There was something about the way the smooth figure was poised on her toes and the cubist one was reaching out to her. I like feeling rewarded for paying attention to details that make something interesting and captivating. Such as a beautiful bronze sculpture, where the smooth figure represents “the Grace, the elegance, the beauty of the art”, and the cubist figure shows “Dalì’s vision of what is beyond the visible surface…the chaotic rhythm of modern life”. It’s a tribute to the duality of dance, of grace and chaos. Can a truer description of dance exist beyond those two words? A dancer’s mind can be a chaotic place - all that remembering of choreography, keeping track of counts, spacing and the ensemble, being aware of alignment, managing expectations and pressure. But that chaos is met on the other side by the grace the dancer exudes, which the audience witnesses and responds to. The chaos can also be released through the emotion of the piece, its accompanying music and the pure movement. I think of the chaos of fitting dance into my life: juggling time, transportation, responsibility, job-search, and the physical and monetary cost. But those moments of grace, when I grasp the barre, feel my mind quiet down and my body responds, are all worth putting up with the chaos. Because Chaos and Grace are the constant, always present partners of any dancer - of anyone going about their life. There is grace and chaos all around us, in everything and every moment: in family, homesickness, friendships, career, love, expectations, joy, grief, and laughter. There are smooth, classic moments and there are sharp, jagged-edged moments in life. Isn’t that why we dance and create art – to reflect that which we experience in real, messy, beautiful, everyday life? Aren’t these things the very same that inspire us, like the Muses, to create and to share? Don’t we need the grace and the chaos in equal parts to live fully? And she’s not just dancing with Chaos, she’s high-fiving it, in a weird, wonderful and surrealist way. 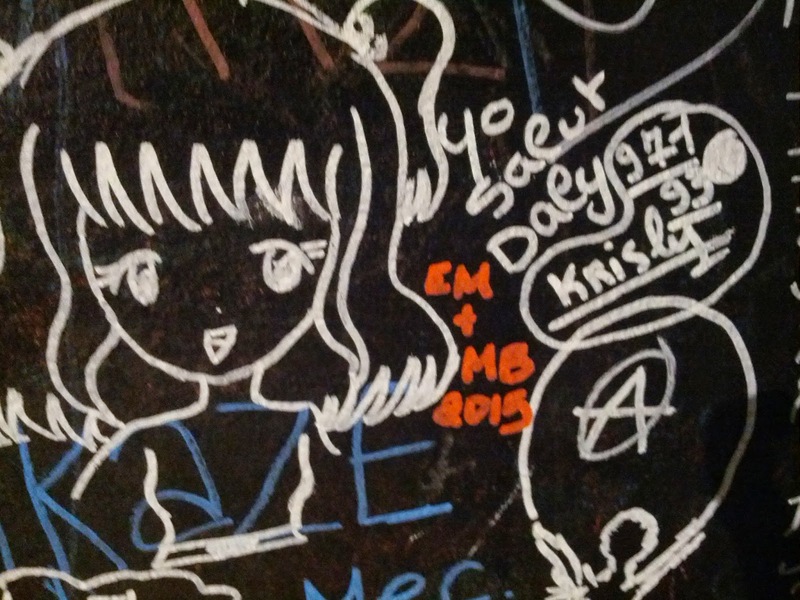 I signed the graffiti wall at Espace Dali! Now we're part of that weird, wonderful place!